The z-score, also known as a standard score, is used in statistics. It measures the number of standard deviations of a specific number. To calculate z-score you can use the following formula. Let’s take a look at the following example. 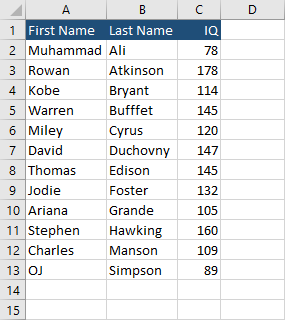 This site iqtestprep.com shows the IQ score for famous people. I chose just a few examples to illustrate how you can calculate mean, standard deviation, and the z-score. You can copy the following example. Calculate the mean for the IQ scores, by using the following formula =AVERAGE(C2:C13) and call it mean. Calculate standard deviation with this formula: =STDEVPA(C2:C13) and call it stdev. 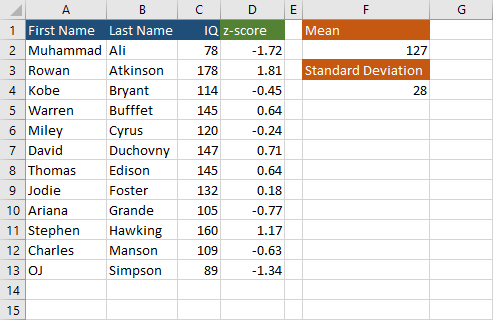 In cell D2, calculate the z-score for the first IQ: =STANDARDIZE(C2, mean, stdev). Use autofill to calculate the remaining z-scores. This is the result of our calculations.